In a computer's graphical user interface ( GUI ), an icon is an image that represents an application, a capability, or some other concept or specific entity with meaning for the user. An icon is usually selectable but can also be a nonselectable image such as a company's logo. When you cut or copy information it gets place in the ………. Clipboard is a short-term storage area for all kinds of information that you have copied from one place and you plan to use in another place. You can copy just about anything to the Clipboard: strings of text, images, video, files, folders, shortcuts, etc. When you copy (or cut) something, it is stored in the Clipboard. When you copy (or cut) something else, that piece of information overwrites the previous contents. This is because Windows provides support for a single clipboard transaction. When you paste the contents of the Clipboard, the contents remains available for further pasting operations. It is overwritten only when you copy or cut something else. A file is a section of main storage used to store data. A file is a collection of information that has been given a name and is stored in secondary memory. A file is the part of a program that is used to describe what the program should do. Floppy disks can only store data, not programs. 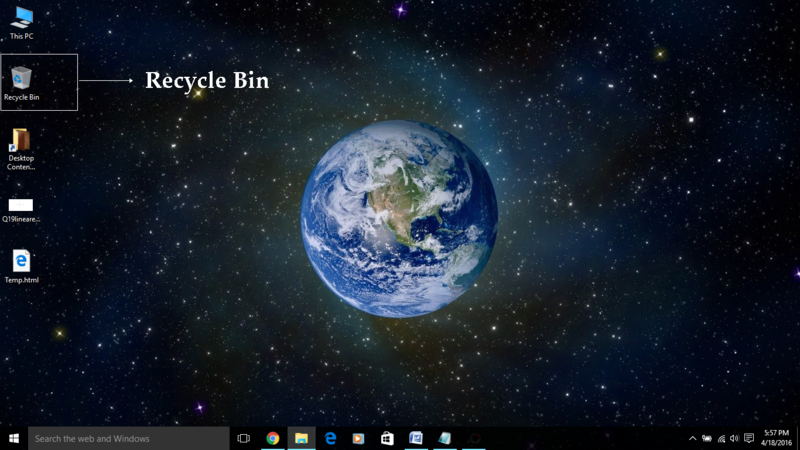 Generally, you access the recycle bin through an icon located ………..
Generally, you access the recycle bin through an icon located on the desktop. A ………. contains commands that can be selected. A menu contains commands that can be selected. Ex: A file menu commonly contains commands about handling of files, such as open, save, and print, the edit menu commonly contains commands relating to the handling of information within a file, e.g. cut and paste and selection commands.